• Put the poem up on the board and explain what onomatopoeia is – the term used to describe words which imitate sounds associated with their meaning. • Encourage the class or groups to produce a performance of the poem. • Put a copy of the poem ‘Sounds in the Night’ on the board. The ———- of voices in the living room. The ———–of the washing machine. The ———–as a light is switched off. The ———- of next door’s broken gate. The ———– of the wind as it whirls round the house. The ———- of footsteps along the pavement. The ——— of traffic along the by-pass. • . Explain that it is a list poem. The onomatopoeic words have been deliberately omitted, so that the children can supply them. The missing words from the lines are 2 murmur, 3 whirr, 4 click, 5 creak, 6 whistling, 7 clatter, 8 rumble. If there are alternatives suggested e.g. howl instead of whistling or roar instead of rumble then accept them and discuss with the class which word they prefer. • Point out that the poem is divided into two halves – the first half dealing with sounds inside the house, the second with sounds outside the house. Invite them to add extra lines to the poem describing other sounds and draft them on the board. Then discuss where they would fit into the poem. • Invite the children to write their own list poems about sounds in a particular place. e.g. sounds of the classroom, sounds of the playground, sounds of the fair. They can begin their poems with the line ‘Listen can you hear?’ Once they have finished drafting their poems, ask them to think about the order of the lines before they copy out the poem. Would putting another line first make a better beginning? Is the last line the best way of ending the poem? 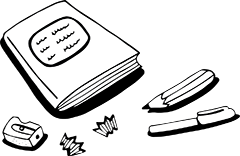 Ask them to indicate any changes they want to make to the order of the lines by numbering them before copying out the finished poem. • Invite the children to write a poem listing ‘Ten Things Heard at the Witches’ Ball’, ‘Ten Things Heard at the Pirates’ Party’ or ‘Ten Things Heard at the Dinosaurs’ Dance’. You can read them the poem ‘Ten Things Heard at Hallowe’en’ to use as a model. The hissing of a witch’s cat. The midnight howl of a werewolf.